Switching between multiple apps during the day? Wishing you could easily access that cool website you saw earlier last week on your phone–but on your PC? You can breathe a sigh of relief knowing that with Timeline, your “stuff” will be easily accessible by chronological view. Just press the Task View button. Before the release of the Windows April 2018 Update, Windows Insiders had a chance to check out upcoming features by downloading Previews. (Check out details on what’s inside the latest Preview here). We asked Insiders to vote on their top 10 favorite features, and Timeline, a new feature to help keep you organized, undoubtedly made the list. Short of time traveling through a wormhole, Timeline is the next best thing for users who want to go back and access activities from the past. Tom Alphin, a Microsoft engineer who has been working on Timeline, recently explained via our podcast the problem that his team wanted to solve. Tom pointed out that even though Microsoft is “investing in making OneDrive a great place for your stuff, we also recognized that people are going to use a mix of things.” Users might have their stuff even on a different laptop and on mobile. Timeline helps make “All the Things” accessible through a single, chronological view of all the documents, web sites, etc. that you may want to get back to. Tom anticipates that Timeline will increase its productivity boosting powers as app developers write more activities into roam APIs. “As developers embrace the platform that Timeline’s built on, you’ll see more and more high-quality activity cards in Timeline coming from the various apps you love,” Tom said. 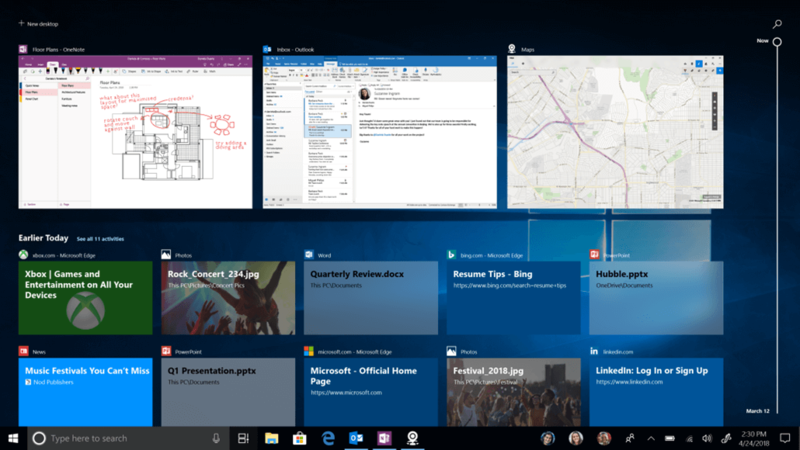 Want to try out upcoming Windows features before they’re released? Download the latest Preview, share your feedback, and help shape the future of Windows.